A gripping collection of six stories of terror - including the novella The Visible Filth, the basis for the upcoming major motion picture - by Shirley Jackson Award-winning author Nathan Ballingrud, hailed as a major new voice by Jeff VanderMeer, Paul Tremblay, and Carmen Maria Machado - “one of the most heavyweight horror authors out there” (The Verge). In his first collection, North American Lake Monsters, Nathan Ballingrud carved out a distinctly singular place in American fiction with his “piercing and merciless” (Toronto Globe and Mail) portrayals of the monsters that haunt our lives - both real and imagined: “What Nathan Ballingrud does in North American Lake Monsters is to reinvigorate the horror tradition” (Los Angeles Review of Books). 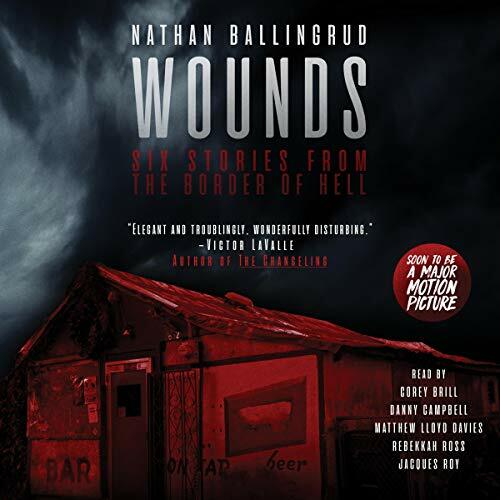 Now, in Wounds, Ballingrud follows up with an even more confounding, strange, and utterly entrancing collection of six stories, including one new novella. From the eerie dread descending upon a New Orleans dive bartender after a cell phone is left behind in a rollicking bar fight in The Visible Filth to the search for the map of hell in “The Butcher’s Table”, Ballingrud’s beautifully crafted stories are riveting in their quietly terrifying depictions of the murky line between the known and the unknown. I was really impressed by the quality of the short stories in this collection and the structure of the overall book. It took me to around the third story to figure out that while the stories all have varying settings and themes, they are all drawn together by the same concept of "hell". The final story brings the collection full circle and gives more insight into the first story. The narrators were all amazing and match the tone and setting of each story. This is the first work by Nathan Ballingrud I've read/listened to, but I plan to check out the rest right away. Also, I'm really excited to see the adaptation of Wounds this summer.